Nancy has more than two decades of experience in strategic planning, change management, and human resource development. She helps organizations achieve their results through the design and implementation of interventions that enable people to use or improve organizational systems and processes. Nancy provides consulting, training and facilitation in strategic and operational planning, team building, change management, leadership development and performance consulting. Nancy’s experience includes internal consulting and management positions at various Atlanta banks. She also works with various clients as a self-employed practitioner. Nancy has worked with higher education, state and municipal governments, financial institutions, global electronics and communications, aeronautical engineering, and publishing. Her work with these organizations includes strategic planning, assisting with systems conversions and mergers/acquisitions, organizational restructuring, redefining job responsibilities and managing change, succession planning, leadership development/assessment and coaching. Nancy speaks on a variety of topics related to management and human resource development. She has presented at national American Society for Training and Development (ASTD) conferences, and the American Management Association Human Resource Conference. A skilled instructor and facilitator, Nancy is certified in various programs of leadership assessment and development, strategic planning facilitation, management, sales and quality service, and career management. She holds a master’s degree in education from Georgia State University (GSU). 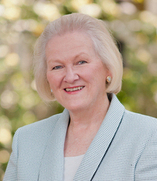 Nancy is past president of the Atlanta Chapter of ASTD and served on the national ASTD awards committee. She is a past member of the GSU Alumni Board, has served as a committee chair for the Organizational Change Alliance and on the boards of the South Cobb Arts Alliance and the Taylor Brawner House Foundation. Nancy’s personal interests include international travel, reading historical novels, spending time with her dog Gulliver and gardening. Her goal is to create a serene garden that encloses a secret garden with animal topiaries. To do that, she is placing more “yard time” into her busy schedule and researching the best methods for realizing her dream.